As the weather has been getting warmer and our children have been really enjoying the outdoors. We have been having lots of water and messy play, slime, gloop and shaving foam have been a hit. This is a wonderful way for the children to explore different textures and have great fun getting messy at the same time. Animals has been another interest going on at the moment. The children have been exploring this interest through dramatic play, art, and also technology. It is wonderful to see where the childrens imaginations take them….some have even been digging for dinosaur bones in the sandpit! Construction seems to be still going strong and mobilo is always a favourite. The Preschoolers have been combining their animal interest with construction and building some amazing zoo’s and even a jurasic world with the dinosaurs. Construction is a wonderful way to support basic maths concepts such as spatial awareness, size, height and weight. Gardening has been a new interest that has also emerged. Some of you may have noticed that we have cleared our gardens out. The children really enjoyed getting stuck in pulling all the weeds and old plants out. We have now got a new planter box so we are going to plant some flowers and vegetables. The Preschoolers have just loved watching our sunflowers grow so it will be exciting to see some vegetables growing and no doubt the children will love eating them once they are ready. Through these experiences we are hoping the children will develop an understanding of where their vegetables come from and also a sense of responsibility as they will have to water and care for the garden. Finally we have had some exciting celebrations over the past month. 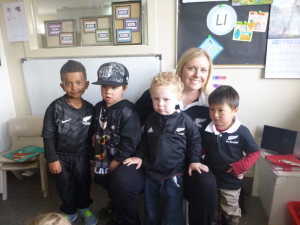 First was the ‘Rugby World Cup‘ where the children showed their support to the All Blacks by having a ‘black day’ the Preschoolers were very excited when the All Blacks won the trophy!! We then had a wonderful day celebrating Diwali. Anjina made a delicious curry and the children helped her make some roti which we all had for lunch. 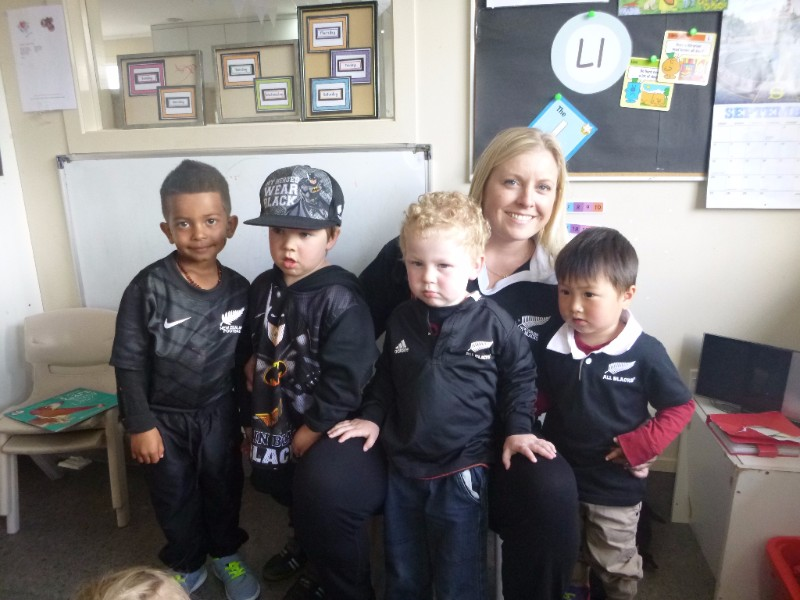 It has been another busy month in the Preschool room. We have welcomed some new children, some have moved up from the Babies and Toddlers room and other children are new to Rockabye. Sadly we have said goodbye to many of our children who are off to school to begin an exciting new adventure, so we wish them all the very best! Next up will be the Christmas celebrations…….where has the year gone!! The staff at Rockabye are second to none! On more than one occasion I've been able to bounce ideas of them, at drop off or pick up, on little matters like what to do for fireworks night to the bigger worries of parenting such as developmental progress. Many of the staff are also parents who listen without judgement and with experience in the “real life“!